I was recently sent Insta Naturals' Deep Cleansing Facial Oil for review. Our Deep Cleansing Facial Oil contains the perfect blend of ingredients that melt away dirt, impurities and makeup without stripping the skin of its natural oils or disturbing the natural pH balance. This energizing blend of oils will gently clean your pores and remove dead skin cells, leaving your skin smooth and nourished. Use with a washcloth or sponge and rinse off with warm water. Leaves a soft and silky feel on the skin. Wonderful for all skin types and especially regenerative for mature skin. Also great to calm skin after shaving or sun burns. Can be used to remove makeup - even mascara! This is a brand new product (with new branding) we are introducing and would like YOU to be one of the first to try it out and give feedback. You might be thinking how can I cleanse my face with oil? Well actually this method has been used for a very long time. To use I would squirt a few pumps in my hand and rub all over my face. Then like magic my makeup melted. It evenremoved my eye makeup easily - which was a big hit for me because I've been having trouble with getting it off with my normal cleanser. I found that for me I preferred to rinse with water and dry with a towel. After drying my skin felt soft and moisturized - not greasy at all. I did not notice any additional oil on my skin from using this product - just soft moisturized skin. I'm totally pleased and would definitely purchase again in the future. 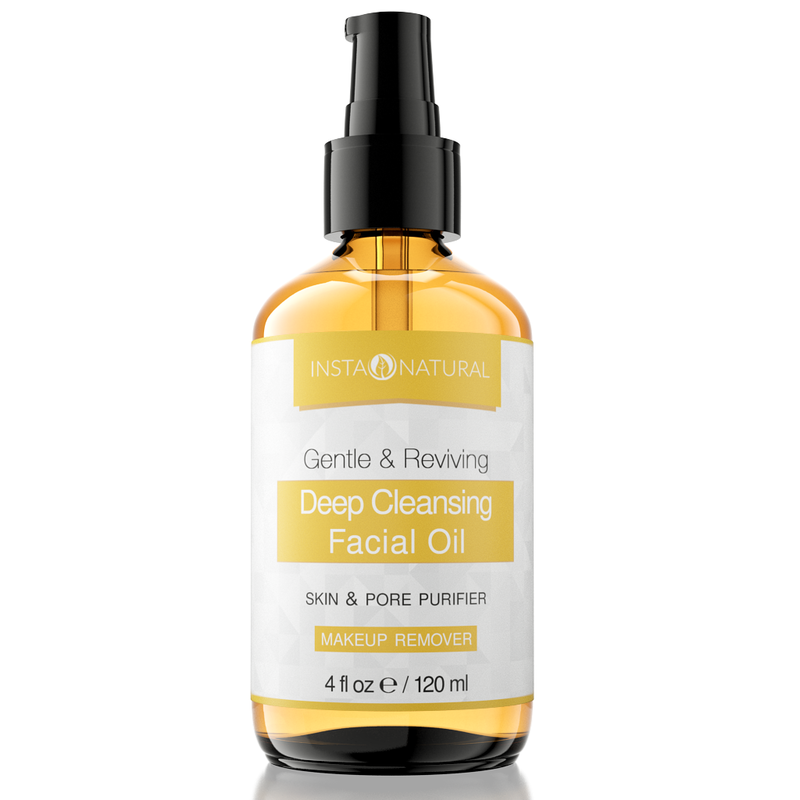 You can purchase your Deep Cleansing Facial Oil by Insta Naturals at Amazon. I received this product for review purposes. This post contains affiliate links.